OK, you read the book ... then you see the movie. Very rarely does the movie live up to expectations. It starts with a severe handicap because you already have all the pictures and all the characters indelibly painted in your mind, and it invariably disappoints. That's the experience I had when I first began playing Return to Zork (RTZ) because I was (and still am) a big Zork fan and I'd played all but one of the previous games. I was particularly disappointed when the adventurer was identified as a male in RTZ by the use of a male face to indicate 'attitude' during conversations when, as a mere female, I had so far succeeded in solving all the previous tests. (And I really did feel it was ME being deafened by the echoes and getting lost in the twisty passages that all looked the same in the original text games). But despite my resistance, which was quite sharp at the time, I still managed to enjoy this darn game. Even with its 'sins' it kept me entertained for days, and it was over all too soon. The game starts with a 'bang' with some pretty stirring music (especially played through your sound system speakers) as you zoom in on the 'white house', and text reminiscent of all the old games appears on screen. Though I wanted to stay put and find a way inside, it wasn't long before I was very happy that I accepted my sweepstake's winnings and was drawn into the mystery of why the vultures were so feared and why the town of Shanbar was a mere reflection of its old self as it vanished building by building. RTZ was one of the first computer games to utilise live actors and though the quirky characters take some getting used to (Boos drove me up the wall and I wished he'd stayed unconscious after I'd plied him with Rye ... you'll know what I'm talking about if you play the game) it was an interesting and novel experience at the time. It is a first person inventory based adventure game with many characters to meet, and many, many clues to watch out for along the way. Conversation mode allows you to talk generally to game characters, or to ask about specifics, and it's important to do both. Each conversation is meticulously recorded so that you can re-cap on what is said, and you can also take photographs wherever you go (you are on vacation, after all.) When it comes to asking about specifics a menu appears on screen so you can ask about inventory items, about recorded conversations or about locations on your map or featured in your photographs. The opportunities here are endless ... in the extreme. This is one part of the game that could have been streamlined to save a lot of repetitiveness, but it didn't spoil the fun for me. I'm one of those players who appreciates accumulating points in adventure games because it gives me that extra incentive not to miss a single thing. It's tricky getting full points in this game, I didn't quite make it, but for every puzzle solved or important action completed you are awarded points towards a score of 225. And there are many items to collect and some fine puzzles to keep the gears crunching away and the scoreboard increasing. There are three mazes, although one doesn't require too much mapping if you play it smart, plus a sliding tile puzzle and a range of pure adventuring problems, some of which are quite inventive and truly satisfying to work out for yourself. It's such a shame that there are so many RTZ walkthroughs about (ouch, we've got one) because you should never use a walkthrough with a Zork adventure. Having said that, novices will likely need some help in finishing this game, but intermediate to experienced adventurers will find more than enough problems to keep them happy. It's all mouse controlled although there are also keyboard equivalents for all actions if you happen to be mouseless. There are options to toggle sound effects, music, and text off and on, although the text option simply makes the cursor 'smart' and identifies significant objects on screen. There are no text captions for speech so if you have any hearing problems you'll have to put a black mark against RTZ. To do things you just point the cursor and click, after which a small menu of appropriate actions is displayed: look, talk, pick up, open, etc. The same goes for inventory objects, to use them you just extract them from your inventory and click on screen for the verb list. You can study objects in close up, manipulate them, and use one object on another when necessary. There are plenty of locations to investigate and reading everything you find (especially the files in the Mayor's Office) is essential if you want to get anywhere at all. RTZ is about five years old now and it's a sad fact that this kind of game using real actors and snippets of full motion video seems to age more quickly than the cartoon graphic variety. Don't let this put you off. It is worthwhile. Also, if you have played Zork Nemesis be warned that this game is not the same. It's a very different experience, but equally as good as far as I'm concerned though I know that Zork Nemesis has its fans who might not agree with this reckoning. Try it anyway, it's much nearer in 'feel' to the very latest Zork episode, Zork Grand Inquisitor, though not as humorous or as technically advanced, and it doesn't capture that 'Zork' atmosphere to the same degree. In its favour, however, it is a longer game with lots of very good puzzles to ensure a good few days (or longer) of entertaining gameplay. 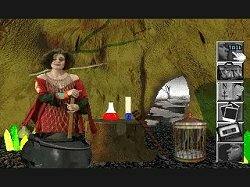 See the metzomagic.com Return to Zork walkthrough. Copyright © Rosemary Young 1998. All rights reserved.